This article is about the country house. For the safari park, see Longleat Safari Park. Longleat is an English stately home and the seat of the Marquesses of Bath. It is a leading and early example of the Elizabethan prodigy house. It is adjacent to the village of Horningsham and near the towns of Warminster and Westbury in Wiltshire and Frome in Somerset. It is noted for its Elizabethan country house, maze, landscaped parkland and safari park. The house is set in 1,000 acres (400 ha) of parkland landscaped by Capability Brown, with 4,000 acres (1,600 ha) of let farmland and 4,000 acres (1,600 ha) of woodland, which includes a Center Parcs holiday village. It was the first stately home to open to the public, and the Longleat estate includes the first safari park outside Africa. Longleat was previously an Augustinian priory. The name comes from "leat", an artificial waterway or channel such as that which supplies a watermill. Thomas Thynne, 1st Viscount Weymouth (1640–1714) started the house's large book collection. Formal gardens, canals, fountains and parterres were created by George London with sculptures by Arnold Quellin and Chevalier David. The Best Gallery, Long Gallery, Old Library and Chapel were all added due to Wren. In 1707, Thomas Thynne founded a grammar school for boys in the market town of Warminster, near to his family seat, to teach the boys of Warminster, Longbridge Deverill, and Monkton Deverill. Over time this became known as the Lord Weymouth School; in 1973 Lord Weymouth's School merged with St. Monica's School for girls and continues today as Warminster School. Thomas Thynne, 2nd Viscount Weymouth (1710–1751) married Louisa Carteret, whose ghost is reputed to haunt the house as the 'Green Lady'. Thomas Thynne, 1st Marquess of Bath (1734–1796) employed Capability Brown who replaced the formal gardens with a landscaped park and dramatic drives and entrance roads. Thomas Thynne, 2nd Marquess of Bath (1765–1837) employed Jeffry Wyatville to modernise the house and received advice from Humphrey Repton on the grounds. Wyatville demolished several parts of the house, including Wren's staircase, and replaced them with galleries and a grand staircase. He also constructed many outbuildings including the Orangery. John Thynne, 4th Marquess of Bath (1831–1896) collected Italian fine arts. He employed John Crace, whose prior work included Brighton Pavilion, Woburn Abbey, Chatsworth House and the Palace of Westminster, to add Italian renaissance style interiors. Thomas Thynne, 5th Marquess of Bath (1862–1946). During World War I, the house was used as a temporary hospital. During World War II, it became the evacuated Royal School for Daughters of Officers of the Army. An American hospital was also constructed on the grounds. Henry Thynne, 6th Marquess of Bath (1905–1992). In 1947, death duties forced the sale of a large part of the Marquess' estates; to allow Longleat itself to survive, he opened the house to public visitors. Russell Page redesigned the gardens around the house to allow for tourists. The safari park opened in 1966. Alexander Thynn, 7th Marquess of Bath (born 1932) is an artist and mural painter with a penchant for mazes and labyrinths (he created the hedge maze, the love labyrinth, the sun maze, the lunar labyrinth and King Arthur's maze on the property). Ceawlin Thynn, Viscount Weymouth (born 1974), currently manages Longleat. The house is still used as the private residence of the Thynn family. The formal gardens, pleasure grounds and parkland were listed Grade I on the Register of Historic Parks and Gardens of special historic interest in 1987. The lower east corridor, a wide room originally used as servant access to the main rooms. This now holds fine furniture and paintings. Also on display are two visitor books, one showing the signatures of Elizabeth II and Philip, the other Albert (George VI) and Elizabeth (the Queen Mother). The Bathroom and bath-bedroom: the bath is a lead-lined tub of coopered construction, originally filled by hand from buckets and drained the same way; taps and drains are now provided. The lead lining was replaced in 2005. The room holds the first plumbed-in flush lavatory in the house. Longleat staged the Red Bull Air Race in 2005. The 2000 Indian Hindi film Mohabbatein was filmed at Longleat, which served as the location for a school in the film. A copy of the painting The Fallen Madonna, a running joke from the BBC television sitcom 'Allo 'Allo, was made for Henry Thynne and hangs in Longleat House. It was transformed into 'Memory Manor', a laboratory to explore memory skills and the working of the brain for the BBC show How to Improve Your Memory. 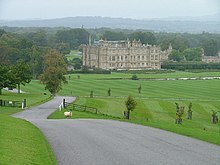 In the 1959 film Libel, Longleat is used as the estate of Dirk Bogarde's character. Longleat Woods (grid reference ST795435) is a 249.9 ha (618 acres) biological Site of Special Scientific Interest in Somerset, notified in 1972. Longleat Forest is also home to Center Parcs Longleat Forest, a holiday resort. Longleat Safari Park opened in 1966 as the first drive-through safari park outside Africa, and is home to over 500 animals, including giraffe, monkeys, rhino, lion, tigers and wolves. Cheetahs are the most recent additions to the safari park with six having arrived in August 2011. Four lion cubs were born in September 2011, making a total of 10 cubs born that year, and Disney named two of them Simba and Nala as part of a co-promotion agreement for the upcoming Lion King 3D film. Longleat House was built in the sixteenth century by Sir John Thynn on the site of a dissolved priory, and in 1949 became the first stately home in Britain to be opened to the public on a commercial basis. The house, park and attractions are open from mid-February to the start of November each year. The 9,800-acre estate, of which the park occupies 900 acres, has long been one of the top British tourist attractions, and has motivated other large landowners to generate income from their heritage in response to rising maintenance costs. Longleat leases 400 acres of land to Center Parcs for the operation of the Longleat Forest holiday village. The Longleat hedge maze is considered the world's longest, with 1.69 miles of pathway. It is constructed using more than 16,000 English yews forming the walls surrounding a central tower and features six raised footbridges. In June 2016 it was reported that the Glastonbury Festival is planned to move to Longleat from the summer of 2019. 5th D. of Buccleuch and had issue. ^ "Spend a day at Longleat". BBC. Retrieved 14 March 2014. ^ "The lions and loins of Longleat". The Sunday Times. Archived from the original on 29 June 2011. Retrieved 14 December 2011. ^ New Scientist, 2 December 1982, p. 554, at Google Books. Retrieved 15 December 2011. ^ Historic England. "Longleat: parks and gardens (1000439)". National Heritage List for England. Retrieved 9 November 2017. ^ John Coles, TV Fallen Madonna found. The Sun, 9 December 2005. Retrieved 15 December 2011. ^ Say ‘Allo’ to new Longleat feature, Wiltshire Times, 16 December 2005. Retrieved 15 December 2011. ^ How to Improve Your Memory, shown 9 August 2006, BBC One. Retrieved 15 December 2011. ^ "Longleat Safari Park, Wiltshire". Tourist Information UK. Retrieved 11 October 2018. ^ "Longleat lion cubs named". Heart.co.uk. 6 October 2011. Retrieved 11 October 2018. ^ "Environment: News & features". The Daily Telegraph. 24 June 2018. Retrieved 11 October 2018. ^ "Longleat Hedge Maze". Atlas Obscura. Retrieved 10 June 2017. ^ Alice Vincent (2 June 2016). "We hope to move Glastonbury to Longleat by 2019, says Michael Eavis". The Daily Telegraph. Retrieved 11 October 2018. ^ a b c Woodfall, H. (1768). The Peerage of England; Containing a Genealogical and Historical Account of All the Peers of that Kingdom Etc. Fourth Edition, Carefully Corrected, and Continued to the Present Time, Volume 6. p. 258. ^ a b Lee, Sidney, ed. (1898). "Thynne, William" . Dictionary of National Biography. 56. London: Smith, Elder & Co.
^ Booth, Muriel. "THYNNE, John (?1550-1604), of Longleat, Wilts". History of Parliament. The History of Parliament Trust. Retrieved 2 January 2016. ^ Lancaster, Henry; Thrush, Andrew. "THYNNE, Charles (c.1568-1652), of Cheddar, Som". History of Parliament. The History of Parliament Trust. Retrieved 2 January 2016. ^ Rugh, R. B.; Critall, Elizabeth. "'Parliamentary history : 1529-1629', in A History of the County of Wiltshire: Volume 5". British History Online. Victoria County History. Retrieved 2 January 2016. ^ Ferris, John P. "THYNNE, Sir James (c.1605-70), of Longbridge Deverill, Wilts". History of Parliament. The History of Parliament Trust. Retrieved 2 January 2016. ^ Helms, M. W.; Ferris, John P. "THYNNE, Sir Thomas (c.1610-c.69), of Richmond, Surr". History of Parliament. The History of Parliament Trust. Retrieved 2 January 2016. ^ Heath-Caldwell, J. J. "Thomas Thynne, 1st Marquess of Bath, 3rd Viscount Weymouth". JJ Heath-Caldwell. Retrieved 2 January 2016. ^ Hayton, D. W. "THYNNE, Hon. Henry (1675-1708)". The History of Parliament. The History of Parliament Trust. Retrieved 2 January 2016. ^ Dunaway, Stewart (2013). Lord John Carteret, Earl Granville - His Life History and the Granville Grants. Lulu. p. 33. ISBN 9781300878070. ^ "Bath, Thomas Thynne". Encyclopedia Britannica 1911. Retrieved 2 January 2016. ^ Thorne, Roland. "Carteret [formerly Thynne], Henry Frederick". Oxford Dictionary of National Biography. Retrieved 2 January 2016. ^ "Thomas Thynne, 2nd Marquess of Bath (1765-1837)". National Portrait Gallery. Retrieved 2 January 2016. ^ Escott, Margaret. "THYNNE, Lord Henry Frederick (1797-1837), of 6 Grovesnor Square, Mdx". History of Parliament. The History of Parliament Trust. Retrieved 2 January 2016. ^ "John Thynne, 4th Marquess of Bath (1831-1896), Diplomat and landowner". National Portrait Gallery. Retrieved 2 January 2016.